I have been hosting or helping at iron sport events in some capacity for better part of the last decade. While many have had memorable moments, the Clash For Cash on Beale is quickly becoming the only event that I think about making better intermittently year round. I was recently asked by my buddy Josh how it actually came to be. As I sat down and recounted all the circumstances that led to a local show with cash prizes and hundreds of spectators, I couldn’t help but smile at all the circumstances that had to happen for this show to go down. 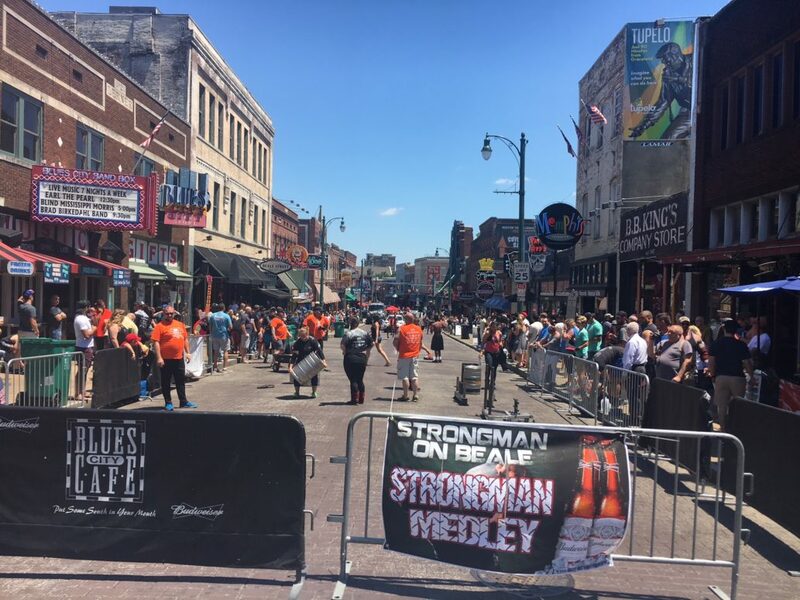 In 2014, I moved to Memphis, TN and was quickly introduced to the local strongman scene. What a freaking Jackpot. Mike Tumminello, Martin Wieckowski, Richard Brose, Jay Holder, Bradley Leavitt, Britten Klibert, Monica Martin, and Ali Vanelli all took time out of their training at times to help me get a handle on the local scene, the implements we had, and the potential there was in this sport. They also helped me go from half-heartedly playing around with implements to making a serious run at national level competition. During that time, I got to experience shows that ran great and shows that were a nightmare. I knew that I could be doing better when it came to our yearly local show. Fast forward to 2016. We had just moved to a new facility and decided that we were going to cut our contest schedule a hair to accommodate one local show, but we wanted to make it huge. We received a half-hearted tip off that our local recreation association was offering grant money to events that were hosted in a number of parks in the area. David Allen and I discussed the possibility, but it was shut down fairly quickly when we were not eligible for the grant. With the original park idea and the grant money now out of the question, we needed to rethink our strategy entirely. Enter Jim Losapio. Jim is a longtime client of NBS Fitness who is very active in the Downtown Memphis merchant scene. While I had all but resigned to hosting another backyard brawl, David suggested we talk to Jim about hosting it outside his local Italian eatery. As soon as we mentioned it, Jim encouraged us to think bigger and host the event on Beale Street. From there, we were able to garner merchant support for each event, as well as obtain adequate space, permissions, and prize money! Our first year wasn’t huge, and I would be lying if I said I wasn’t biting my nails all the way into the show. 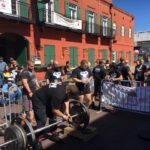 However, with help of the NBS Strongman competitors, the word spread and we were able to put on a show. Much to my own surprise, the spectators caught a glimpse of the show, and hundreds stayed to cheer on their new-found strongman favorites. David Allen: well duh. NBS and equipment aside, I just couldn’t host the quality of show without Davids help. Everytime I drop a detail, David picks it up before it hits the ground. He does not get enough credit for how crucial he is in the background at these shows. Jim Losapio: Had it not been for Jim, we would be hosting this event in the back lot of NBS. He was the man behind the idea, and the man behind the support. Mike Tumminello: Ill always be thankful that Mike lets me be an occasional part of the Llama Bear tribe. His input on lifting and the shows has been invaluable. Richard Brose: Richard is the first to volunteer his Saturday, and pours the most effort into each task he is given. He is our reliable head judge, and he just rocks. Monica Martin: Not only does Monica volunteer her precious Saturday, but she also volunteers her husbands math skills for scoring. She also is nearly always in a chipper mood, which helps alleviate my own anxiety.